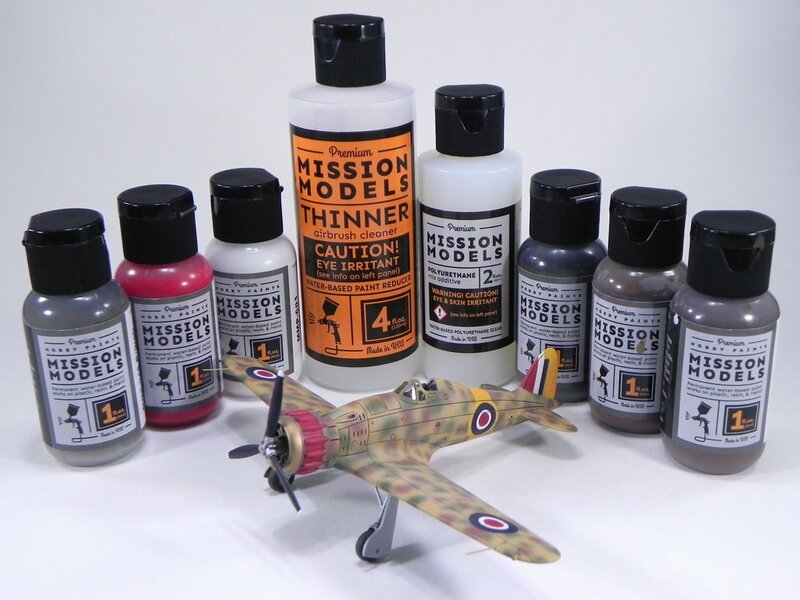 After reviewing the new Mission Models acrylic paints and being really impressed with their performance, I was eagerly looking for a quick project on which to use them. A quick trip to Skyway, my favorite Seattle hobby shop, and the problem was solved in the form of the Hobby Boss 1/72 Saetta. This is a very nice looking airplane: round motor, open cockpit, retractable gear—what’s not to like? Being an “Easy Assembly” kit, the build took all of one day but the mottled blotched scheme took the better part of a week and was a real joy to shoot. Prior to trying Mission Models (MM) paints I would have reached for my AKAN or Gunze lacquers to do the mottled blotches of this scheme. But, the ease with which you can perform fine-line work with MM really lends the paint to this kind of application. As I anticipated, the forgiving nature of the paint made the painting process a much more enjoyable affair. 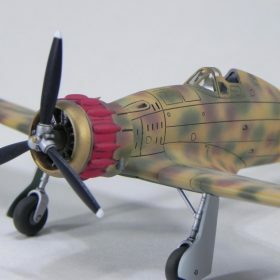 In addition, all of the Italian Air Force colors used on the build were custom mixes using MM paints. The whole project served as a quick and enjoyable break from some of the longer builds I’ve been doing. I hope you enjoy it. The Macchi C.200 Saetta or Arrow was built by Aeronautica Macchi and used in various forms throughout the Regia Aeronautica in World War II. The Saetta had excellent maneuverability, sturdy construction, and was generally liked by its pilots. Stability in high-speed dives in particular, was exceptional. It was however, underpowered and underarmed in comparison to its contemporaries. 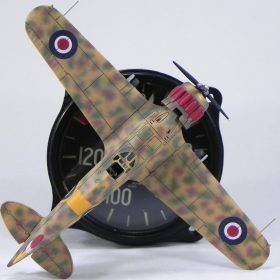 From the time Italy entered war on 10 June 1940, until the armistice of 8 September 1943, the C. 200 flew more operational sorties than any Italian aircraft ranging over Greece, North Africa, Yugoslavia, France, the Mediterranean, and the Soviet Union where it obtained an excellent kill to loss ratio of 88 to 15. Its very strong all-metal construction and air-cooled engine made the aircraft ideal for ground attack and several units flew it as a fighter-bomber. Over 1,000 were built by the time the war ended. (Edited from Wikipedia). This is a Hobby Boss “Easy Assembly Authentic Kit” and I have to agree with the “Easy”, the “Authentic”: not so much. 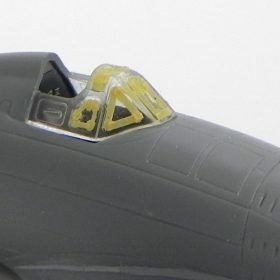 Of note is a very prominent square intake on the ventral nose cowl of the 1/1 scale that is simply missing on this 1/72 version. Likewise, the kit lacks inner gear doors. There are other omissions but let’s not be too picky. 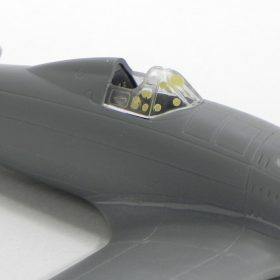 Despite the lack of details, the kit is a marvel of engineering with a one-piece upper fuselage (with vertical stab and rudder), one-piece wing (with ventral fuselage and horizontal stab), and single piece nose cowl that when fitted together capture the lines of the Saetta pretty well. The cowl in particular is amazingly cast being a single piece with engine front rendered in relief. 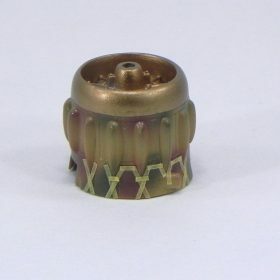 The parts are nicely cast with very little flash. The one-piece canopy is accurately shaped but thick. The cockpit is rudimentary with floor, seat, and stick. All of three (3) parts comprise the entire model not counting the three (3) additional parts of the cockpit so assembly takes just a few hours at most. The main gear legs are nice if not a little crude: same for the main gear doors and tail wheel. 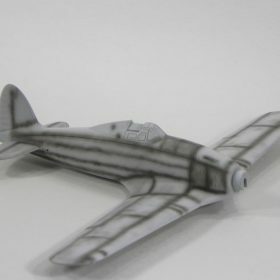 Decals are provided for two aircraft both of which feature mottled schemes. So there you have it: a nice, simple, quick build. But, did I build it out of the box? Well, of course not. Not willing to leave well enough alone, I replaced the seat with one from the spares box and then applied color PE seat belts by Eduard (#73015). Also from Eduard was a color PE instrument panel left over from a bye-gone build that was coerced into fitting quite nicely. A control stick from the spares box and assorted cockpit sidewall details were added and the two main pieces joined with Tamiya Extra Thin Cement. That’s when the only seam of the build presented itself and it’s a doozy that cuts across multiple fuselage panel lines that had to be filled and re-scribed. In addition, two gun barrels that are molded into the upper fuselage decking actually point directly into the nose cowl when assembled: bad engineering here and not easy to fix. Since the scheme I’ve chosen is that of a captured aircraft, I opted to assume that the guns and gun sight were removed. That’s my story and I’m sticking to it. With the fuselage complete, the canopy was buffed out with Novus plastic polish and a microfiber swab followed by a final buffing with a dry Kimwipe. It was then dipped in Future Floor Wax (Pledge with Future Shine) and after it was dry affixed using Super-Gold CA glue (Bob Smith). I had no pre-cut canopy masks for the kit and all the rounded corners of the canopy frames present a bit of a challenge. A quick fix for a situation like this is to cut small circles out of Tamiya tape that have a radius matching the window corners. Having a good assortment of PE stencils will allow you to find a good match. 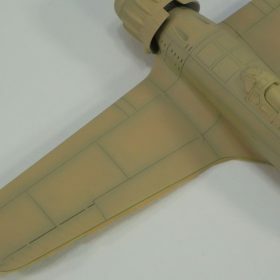 Once cut, the tape circles are placed in the corners of the canopy and are connected with small strips of Tamiya tape, which are then burnished down. With the perimeter of each window taped off, the centers were filled with Mr. Hobby Mr. Masking Solution and the job was done. Now on to my favorite part: shooting paint. 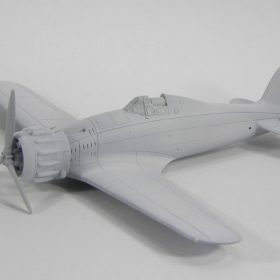 To prepare the model for primer it was wiped down with a Kimwipe saturated in Denatured Alcohol (Crown). 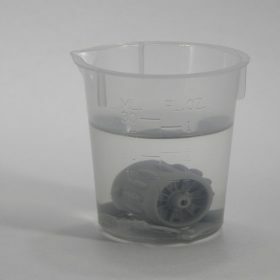 The smaller parts were placed in a beaker filled with alcohol and allowed to sit for 15 minutes. This is a great way of de-greasing small parts prior to painting. Once dry, all were sprayed with Mission Models (MM) White Primer diluted to 60% primer with MM Thinner (Note: do not add MM Polyurethane Mix Additive to MM Primers). This was sprayed at ~18psi with a Harder&Steenbeck Evolution fitted with a 0.2mm tip. Air was supplied by an Iwata Studio Series tanked compressor and regulated with a Harder&Steenbeck In-line control valve. MM primer offers great coverage, is easy to shoot, and has very little over-spray. After a drying time of ~2 hours, the primer coat was wet sanded with a 4000 micromesh pad and buffed with a dry Kimwipe. Prior to the first color coat, panel lines were pre-shaded with MM British Slate Grey shot at ~12psi with a Harder&Steenbeck Infinity with a 0.15mm tip. I opted for slate grey here as black would have been too much contrast for the yellow and tan over coats. To thin Mission Models paints for spraying, I prepare a solution of MM Thinner to which MM Polyurethane Mix Additive (a flow and leveling agent) has been added to ~10% or a ratio of 1:10 (Thinner-10). I prepare and store large volumes (40ml) of Thinner-10 in air-tight bottles so it’s always ready when needed. I then dilute my paint directly into Thinner-10 for spraying. I’ve used this technique for many years with other acrylics and it works great for Mission Models as well. For fine-line work like pre-shading 1/72 aircraft, I start with a 1:1 dilution of MM paint to Thinner-10 and spray at ~12 psi. To find the ideal dilution for the work at hand, I’ll test the fine-line performance of the 1:1 mix while adding more Thinner-10 drop-wise being sure to stir it with a 0.5ml pipette each time. I also drop the pressure down to ~10psi on the compressor dial and reduce it more with an In-line air control valve while maneuvering the airbrush closer to the surface of the model (1-2 inches). With a little trial and error, the right combination of dilution, pressure, distance, and lever movement is achieved and then it’s a matter of technique and practice. With the pre-shading complete, it was time for some color. 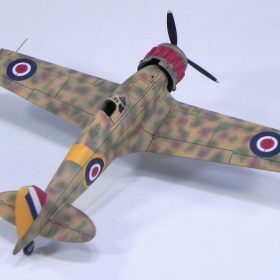 The scheme I chose for this Saetta is that of an aircraft captured by the RAF in Sicily, 1943 (see link below). 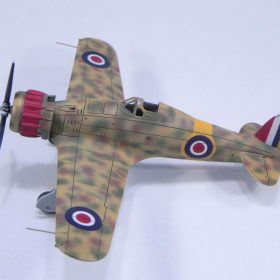 With the yellow waistband and rudder, Italian desert camo, and RAF roundels, it was just the scheme I was looking for. I opted to paint the yellow waistband and rudder first and then mask both prior to additional coats of paint. 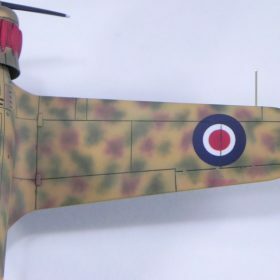 The blue and white portions of the waistband-roundels would be decals from an Eagle Strike decal sheet “Early Spitfire/Hurricane Roundels (#72064). To ensure the correct color yellow, Mission Models Yellow was matched to the the yellow on the roundels sheet. To do this, 1 ml of MM Yellow (007) was placed in a spin tube and MM Red (003) and White (001) were added drop-wise with a 0.5ml pipette and mixed until a closely matching color was achieved. The yellow was then diluted to 60% with Thinner-10 and shot at ~15psi with an H&S Evolution with 0.2mm tip. After the yellow areas had dried for 2 hours the waistband and rudder were masked with Tamiya tape and I took stock of the situation. Clearly, I got a little carried away with the yellow eh? To prevent the yellow from affecting the hue of the tan and grey overcoats, these areas were re-shot with MM White (001) diluted to 60% with Thinner-10. After another quick round of panel line pre-shading (performed as described above), the offending yellow areas were deemed repaired and the model readied for the next step: the Italian grey-blue. But, before I could shoot it, I had to mix it. 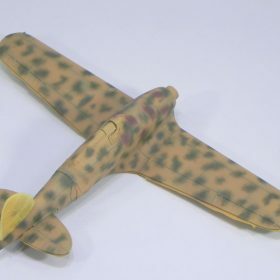 Accurate paints of Italian WWII Air Force colors are not widely available. A couple of manufacturers have produced them but often only in box sets. 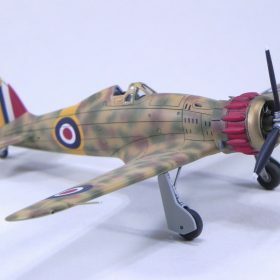 Fortunately, most of the Italian Air Force colors as produced by LifeColor Acrylics are stored in the secret underground Model Paint Solutions Strategic Paint Library. 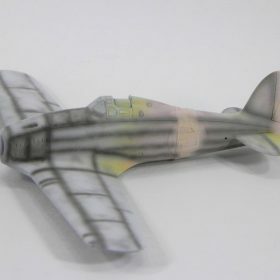 The color and hue of these paints agree quite well with the color figures in the Aero Details #15 Macchi C.200/202/205. Using these two references, I mixed all the colors required for this build using Mission Model paints and it was surprisingly easy to do. Recipes for these colors are provided below. On my workbench the component paints for each mix were measured into a 15 ml graduated beaker by counting drops or by pipette. To facilitate mixing and compensate for the high viscosity of Mission Models paints, a small amount of MM Thinner (~0.25ml) was added to each mix, which was blended with a spatula and transferred into a 6ml storage bottle with a pipette. Prior to spraying, each color was lightened ~15% with MM White (001). The amount of White added to each is also provided. Please note that the mixtures are based on the assumption that the average-sized drop squeezed by the average-sized hand on the average-sized day is .05ml: the size of the “average” drop. This is a rather large assumption. That being the case please take the following color recipes as suggestions and use your own judgment and color-sense as you prepare each. In general, paints tend to darken in color as they dry so it’s best to continually test your mix by painting small dots on a piece of white paper while the component colors are being added. To lighten 15%, add 9 drops or 0.46ml of White (001). Note: MMP Blue (045) is very potent when diluting into the above mixture so, it’s quite easy to over-shoot. I placed 2 drops of the blue on a glass surface and then, from that, picked up approximately 1/2 a drop at a time on a small microbrush. This allowed me to gradually add the blue until the desired color was achieved. The Grigio (Blue-Grey) was then diluted to 60% with Thinner-10 and sprayed at ~12psi with an H&S Evolution with a 0.2mm tip. After this was allowed to dry overnight, the undersurfaces were masked with Tamiya tape and the upper surfaces sprayed with Giallo (yellow-tan) diluted to 60% with Thinner-10 and applied with an H&S Evolution as described above. Both the Grigio and Giallo were applied first as a light, dry coats followed by multiple light fill-in coats. This approach allowed me to gradually increase the opacity of the coverage in balance with the underlying pre-shading. To lighten 15%, add 10.5 drops or 0.52ml of White (001). With the Grigio and Giallo shot, it was time to start thinking about spraying blotches. 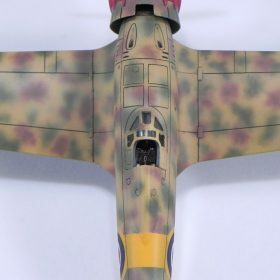 Close examination of Italian WWII aircraft schemes reveals an amazing array of mottles, blotches, squiggles, and shapes for which I have no names. Much has been written about the complexities of these paint schemes. For me, being able to reproduce blotches that appear wispy and airy: lacking a hard line delineating their periphery has always been a challenge. The amazing fine-line performance of Mission Models paints prompted me to give it a try. I started with the Verde (green). This was initially diluted 1:1 with Thinner-10 and then diluted with more Thinner-10 as I decreased spraying pressure and “dialed in” a nice, reliable fine line of less than 1mm in width (as described above). The blotches were shot with H&S Grafo T.1 and Infinity airbrushes fitted 0.15mm tips. The working distance between the airbrush tip and the model surface was ~1 inch: close. 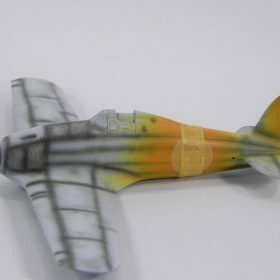 To spray each blotch, a fine-line was established in the estimated center of the blotch-to-be and the airbrush was wiggled or moved very rapidly in the general shape of the blotch. By doing so, the shape of the blotch was filled-in from the center out with a series of overlapping fine lines. When successful, the resulting blotch has an airiness to it that looks quite convincing. Could I pull that trick off on every blotch? Nope, not even close. But, by the end of the painting process I was nailing about 80%, which ain’t too shabby for a first try in this scale. And, most importantly, it was fun. To lighten 15% add 10 drops or 0.5ml of White (001). Note: MM Black (047) is very potent. I added it drop-wise with continual mixing until the desired color was achieved. Go slow and use your color-sense. With the green blotches completed, I started in on the Bruno or red-brown blotches using the same technique as described above. After the Bruno blotches were applied, I cleaned up some of the more unruly blotches of both colors with some of the Giallo (yellow-tan) dialed in for fine-line spraying with an H&S Grafo with a 0.15mm tip. After one more round of touch ups with both the Verde and the Bruno, the blotches were done. The model was then sprayed with Alclad Aqua Gloss and set aside to dry for 24 hours. To lighten 15%, add 9.5 drops or 0.48ml of White (001). 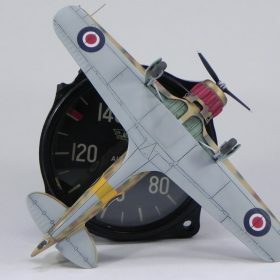 So that the red centers of the RAF roundels would match the red on both the fin flash and the cowl speed bumps, these items were painted as opposed to using decals. The decals used for the outer blue and white portions of the roundels supplies the red center of each roundel as a separate decal: fortunate. The partial roundels (minus the red centers) were applied to the fuselage sides and wings (upper and lower) using Micro-Set and –Sol and conventional techniques. Twelve hours later the roundels were given a good coat of Alclad Aqua Gloss. After an additional 12 hours Tamiya tape masks for the red centers were carefully applied. The stickiness of the stencils was decreased by rubbing the tape multiple times against my fingers. The roundel centers were then sprayed with a custom mix of MM Red (003) to which a couple drops of MM Brown (002) were added. This was applied with an H&S Infinity with a 0.2mm tip at ~12psi. To lessen the chance of wet paint wicking under the tape masks, the red was applied using multiple light dry-coats, no wet-coat. Once the red was dry the tape masks were carefully removed from the underlying decals (a nail biter for sure) and I breathed a sigh of relief. After the yellow rudder was masked off, the blue stripe of the fin flash was applied using a piece of blue decal cut from the RAF roundels sheet. This ensured that the blue stripe would match the blue of the roundels. When this was dry, it was over sprayed with Alclad Aqua Gloss and 12 hours later was covered with Tamiya tape. The fin flash was then taped off and shot MM White (001) diluted to 60% with Thinner-10 using an H&S Evolution airbrush with a 0.2mm tip. When this was dry, strips of Tamiya tape were applied over areas that would be the white stripe of the flash. This was then shot with the same custom red and technique as used for the red of the roundels (above). 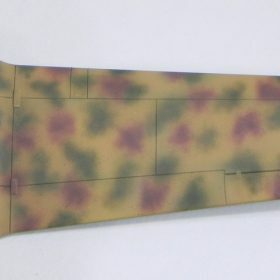 The cooling ring on the cowl was first shot with AK Brass (#AK672) and after being masked with Tamiya tape, the remainder of the cowl was painted Giallo and received Verde and Bruno blotches at the same time the other pieces of the model were painted. In preparation for red paint, the cowl speed bumps were carefully taped off with small strips of Tamiya tape. To make sure the underlying tan paint wouldn’t affect the red, the speed bumps were first painted MM White (001) diluted to 60% with Thinner-10. The speed bumps were then shot with the same custom red and technique as used for the red of the roundels (above). 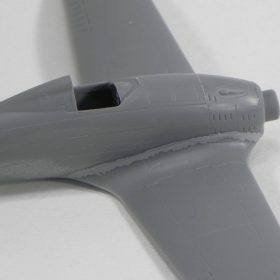 The tips of the propeller blades (previously sprayed with MM White Primer) were covered with Tamiya tape and the remainder of each blade was sprayed with MM Black (047) diluted to 60% with Thinner-10. This was applied at ~12psi with an H&S Evolution with a 0.2mm tip. When dry, the blades were taped off and wrapped with Parafilm and the propeller hub was shot with Vallejo Aluminum (#71.062) diluted to ~40% paint with Vallejo thinner containing 5% Liquitex as previously described. This was applied with Evolution with a 0.2mm tip at ~15psi. After removing the tape and Parafilm, hub details were picked out with Vallejo Brass and the prop was given an oil wash with Tamiya Dark Brown Panel Line Accent Color (#87140). The wheel wells and gear doors were painted by hand using a custom mix of LifeColor paint that I prepared many-a-year ago. When this was dry, the wheel wells were given a wash with Tamiya Dark Brown Panel Line Accent Color. The main gear legs were sprayed with Vallejo Aluminum (#71.062) diluted to ~40% paint with Vallejo thinner containing 5% Liquitex as previously described. After a coat of Alclad Aqua Gloss Clear, they were given an oil wash with Tamiya Dark Brown Panel Line Accent Color and glue to the model with thick CA glue (Bob Smith). The wheel hubs were painted by hand brush using MM British Slate Grey (045) and a couple of drops of Thinner-10. Likewise the tires were painted by hand with MM Tire Black mixed with a few drops of Thinner-10. This is the first time I’ve hand brushed Mission Models paints and I’m very happy with the results. 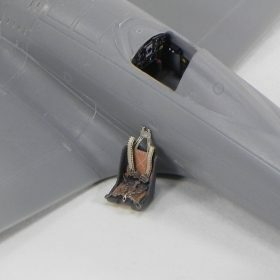 The wheels were then mounted in the gear forks of each main gear leg, the gear doors were applied, and the model readied for a final satin coat. The model was given a final coat of Vallejo Satin varnish diluted to 20% with Vallejo thinner. This was applied at 15psi with an H&S Evolution with a 0.2mm tip. Furthermore, when spraying this final coat, the airbrush was held back from the model as though delivering a dry-coat. In this way, light, misty coats were applied in a controlled manner to ensure the model didn’t become too dull. Unfortunately, I went a bit too far into flat but I can live with it. After the satin was dry, the masks were removed from the canopy, the propeller was affixed, and my Saetta was done. What a kick! Okay, that was a lot of fun. Thanks for reading along. With this build, I finally tackled a WWII Italian Air Force scheme to my satisfaction. In so doing I learned a new technique that I’ll definitely be using again on a project of larger scale. 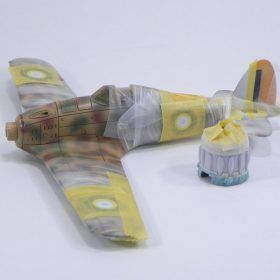 Hello 1/48 Fiat G.50! Mission Models paint gives better fine-line performance than any acrylic paint I’ve experienced. 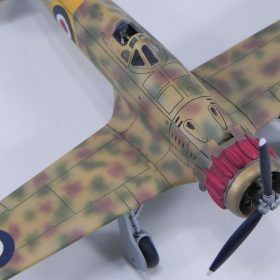 When that is combined with the capabilities of the 0.15mm nozzle in either the H&S Grafo T.1 or Infinity airbrushes, many complex Italian and/or Japanese schemes become possible for this modeler. This is a winning combination that I’ll be using again on future builds. Until then, is there a scheme you’d like to see demonstrated? Is there an airbrush trick or twist you want more information on?